There’s a lot that could be said about Main Street’s Ford News Diner, but perhaps the best compliment I can give it is that it’s the most New Jersey diner I’ve been to outside of the Garden State. For those of you that don’t know, that means three important things: it’s fast, it’s cheap, and it’s delicious. It also means that visiting will give you the full diner experience— sitting at the counter, watching your food get made right in front of you, eating until you feel slightly nauseous. 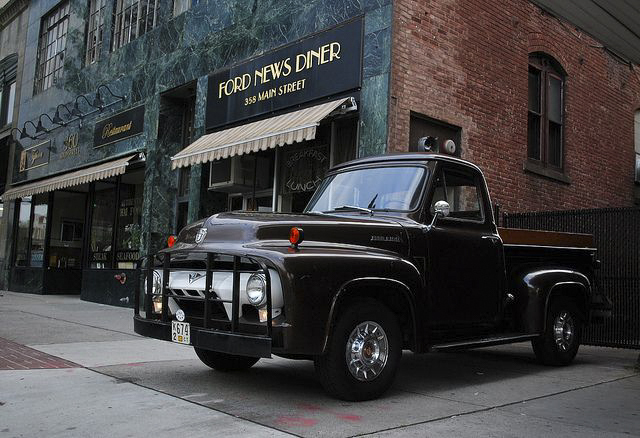 From the moment you step foot inside Ford News Diner, you’re transported to a small town right off the Jersey Turnpike. For you, it feels a little cramped and strange. For me, it feels like home. Ford may be small, but it packs a lot of awesome atmosphere inside. Newspaper clippings, pictures of Wesleyan sports teams, and an old-school griddle right behind the counter come right out of the set of a black and white movie. There’s a menu board overhead and a friendly staff that keeps things nice and simple: you order, you get your food ridiculously fast, and you pay at the register. There aren’t any gimmicks here, just some folks from Middletown talking about football as they eat their BLTs. I think the biggest draw for this diner is that there’s nothing flashy about it. It doesn’t try to be something it isn’t, or sell itself to tourists as an attraction. It exists very simply and comfortably, focused on what a diner should be focused on—food. On its website and on the menu, Ford advertises its “best pancakes ever”, so it only made sense to give them a try. I got to watch them get made, which is always a enticing experience, and they were on my plate within five minutes of placing my order. They were perfectly golden brown, fluffy, and bigger than I could ever eat in one sitting. It seems that making a stack of pancakes at Ford has been reduced to a science. And though they weren’t the best pancakes I’ve ever eaten, they are pretty high up there—and certainly the best I’ve had yet in Middletown. Though my stomach was full, I felt my role demanded a more thorough judgement of what Ford had to offer (it definitely wasn’t just that I struggle with portion control). I’ve always argued that if you want to judge a diner’s food, you need to try three things: the eggs, the french toast, and the potatoes. For those of you who might not be breakfast veterans, these dishes make up the staples of a good diner. Consider it a greasy spoon litmus test, if you will. The idea here is that if they do the simple stuff right, chances are they can make almost anything taste good. Naturally, then, I ordered my three testers, in scrambled, cinnamon-topped, and home fry form, respectively. The eggs were good, if a little overdone. I was thrilled with the french toast, which came freshly made to the point that I could see the egg batter still bubbling. But the real star of the show— the big cheese— wasn’t eggs or toast or even a big cheese. It was those darn potatoes. That’s right, there’s a whole new paragraph here. Because the home fries at Ford News Diner demand their own paragraph. These were the best home fries I have had in my entire life. Saying that about a Connecticut diner could land me in some hot water back home, but it’s worth the risk to write about these potatoes, and to sing their praises. The texture was absolute perfection— a crispy outside with a creamy and hot center. Just a little bit of onion and green pepper mixed in gave them a good taste without taking away attention. The spice was so perfect that even I, a serial adder of ketchup, felt no need to alter anything about the taste. They were the perfect compliment to my main course, but they could have been all I ate that day, and I would’ve been more than happy. The secret to these superb spuds seems to be the secret to all of Ford’s food. Once they know how to do it right, they don’t mess around anymore. It’s served to you exactly the way it should be, it tastes great, and there’s no need to make it any more exciting than it already is. This is classic diner food at its best, and I couldn’t ask for anything better. At the end of the day, it all boils—or broils, depending how you like your eggs—down to one thing. Simplicity. Though you may have heard a lot more about O’Rourke’s down the street, this establishment is a bit of a hidden gem, and is certainly worth a visit. It might not have the widespread appeal of its competitor, and it definitely doesn’t draw you in quite as easily. Even still, it’s important to look for the B-sides sometimes (if we’re assuming that Middletown is a pop single record, and that O’Rourke’s is an A-side, and…you get the metaphor). There’s nothing wrong with bopping your head along to the catchy song, but if you want the real flavor, you have to flip that record over and dive a little deeper. And like a good song, I imagine that Ford News Diner only gets better on your second listen. So go give their famous pancakes a try, and get more familiar with what a diner is supposed to be. You just might end up feeling right at home.